Supplier Research | Asia Trading and Consulting Ltd.
We provide an online platform to quickly research factories, collect quotations and order samples. Our sourcing experts come from a wide variety of businesses and are at your disposal without incurring a fixed cost on your business. Since it's spectacular opening in the 1970s, China has been the factory of the world for a large number of goods. While big multi-national companies have used the country as a production base for many years, better information and increasing cost pressure is forcing small- and medium sized companies to follow suit. Finding the right factory for the job. Buying at the right market price. Knowing the key cost drivers. Each of these problem can be solved on its own, if enough time and resources are available. This is especially true for big companies with dedicated purchasing departments or niche players, who specialize in a single product category. Unfortunately, the tools, processes and methods these established players are using are not suitable for smaller companies, who operate on thinner margins and in a less predictable environment. Get a tailored list of potential suppliers. Quickly find the current market price. Find dominant manufacturing clusters for your goods. Take the pain out of sample collection. 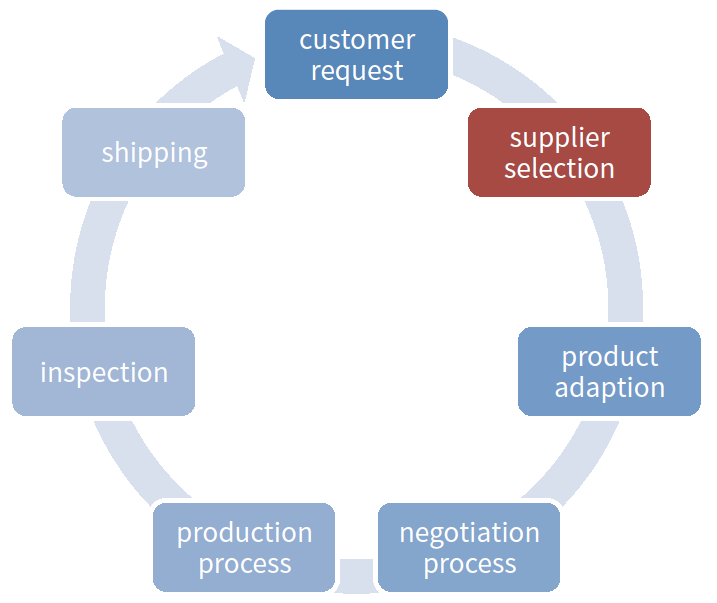 Reduce the administrative effort of supplier selection. Spend less time doing research on the Internet. Prepare quotations faster and get deals done quicker. You give us the specifications of the product you are looking for. This can be done personally, by email or via our self-service online platform. Our sourcing experts find suitable suppliers for your product. We collect quotations for your specific quantity and product features. You receive a quick overview of relevant suppliers, prices and dominant regions. We collect and consolidate samples from all relevant suppliers and forward them to you. You can make an informed buying decision and focus on order execution. Depending on the complexity of your product, you can receive an initial market overview in less than a day. You are not dependent on office hours or time zones. All the data can be accessed in real-time over our platform.